What is Cash for Completion? Cash for Completion is state-provided financial aid that will help you reduce your tuition costs, more than you already have! 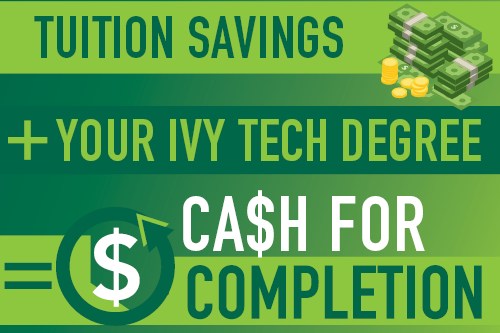 You may not realize it, but as an Ivy Tech student, you have already saved thousands of dollars on your education. Cash for Completion will help you save even more. When you graduate from Ivy Tech then transfer to an eligible four-year institution, Cash for Completion will allow you to earn money through bonuses from the state financial aid program toward your bachelor's degree—helping you save $12,000 or more on tuition costs. Complete an associate’s degree before enrolling in a baccalaureate program, receive $800 per academic year from the state of Indiana in the form of state financial aid. This award is the associate degree completion incentive, which is a part of the state's Frank O'Bannon Grant. Take these savings, on top the $10,000+ in savings from earning your associate degree through Ivy Tech and you will could graduate with little to no student debt! Funds automatically count toward tuition and fees for your bachelor’s degree. They will be made available to you through your Frank O'Bannon state financial aid award at your four-year institution, after you have graduated from Ivy Tech with your associate degree. Do I have to do anything to get this money? Nothing extra if you have already filed your FAFSA—just graduate from Ivy Tech with your associate degree. That’s it! There’s nothing additional to fill out, no running around to turn things in on time—just get your associate degree and transfer to get your bachelor’s at an eligible four-year college or university. How can I confirm my status or track my eligibility throughout college? Throughout your college career (whether at Ivy Tech or once you have transferred to a four-year college or university), you can track your progress in the state's ScholarTrack program. ScholarTrack is your one-stop shop for all of your financial aid needs. Get started at scholartrack.in.gov. We are happy to help! You can call us at 888-IVY-LINE between 7 a.m. and 1 a.m. seven days a week or chat with us online. You can also stop by your local Express Enrollment Center too.